I'm sadly still stuck in air travel as my final flight was canceled out of JFK last night after a six hour delay. Is it just me or is the JFK airport just the worst, most inconvenient, inefficient airport in the world? Luckily enough, I got picked up from the airport from my friend Antonis in Queens and I finally got a hot shower and yummy chinese food. It was perfect and I'm forever grateful. I just have a moment this am to post something as I'm on my way to the airport yet again but wanted to include this recent post I saw on Apartment Therapy. 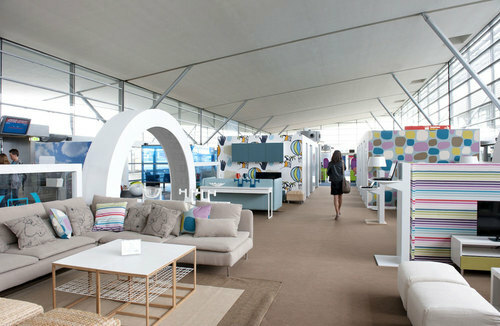 IKEA recently finished this pop up lounge at the Paris De Gaulle airport, which will be open to all passengers until August 5. It just boggles my mind. I would love nothing more than to redesign the Atlanta airport... and I'd start with this amazing pop up lounge for inspiration. It includes 2328 square feet to unwind, watch tv, catch a snooze, play with your kids...and just feel more like a home away from home rather than a stodgy airport. I dream, I dream.... as back to JFK I go. See y'all tomorrow. Click here to see the full post at Apartment Therapy.